Blood Promise (Vampire Academy, book 4) by Richelle Mead. Now Rose must journey to the ends of the earth to find--and kill--her one true love... Or has the time come to join him? Rose Hathaway must risk losing everything, even her best friend, in order to fulfill the wish of the man she loves. 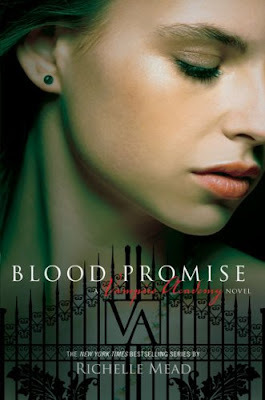 Blood Promise is another fabulous addition to the Vampire Academy series. I am always surprised at how each of the books in this series is even more suspenseful and heartrending than the last. Mead's characters continue to mature and the tension and suspense builds to near unbearable levels. You'll be amazed at what happens within these pages. The Vampire Academy series is a true paranormal romance treasure. I recommend Blood Promise (Vampire Academy, book 4) to readers of paranormal romance, young adult, urban fantasy, action packed vampire fiction and especially to fans of the Vampire Academy series. Visit my review of Vampire Academy (Vampire Academy, book 1) here, Frostbite (Vampire Academy, book 2) here, and Shadow Kiss (Vampire Academy, book 3) here. Blood Promise on Amazon . Wait until you read Spirit Bound, that's another great book in the series! I love this series. Decemeber can't come fast enough.